The more important the presentation, more things will go wrong. If you want to prevent that, you must be proactive. Here are the best practices I have learnt after delivering more than 2000 live sessions! Here I am assuming that your presentation content is already finalized and that you are using PowerPoint 2010 or 2013. First step is to make a copy of the presentation. Whatever is mentioned below should be done on the copy of the presentation. This way, your original presentation is not disturbed in any way, in case something goes wrong. This makes the content and delivery a little safer. But still you need to do the following. Run the entire presentation without any network. Check all embedded file links. These files should open without network connectivity. Check all videos. These are embedded and therefore should run without network. Keep a copy of the entire presentation on USB drive. DO NOT just copy the presentation. See below for instructions. upload it to OneDrive, DropBox or any other storage on internet. OneDrive (or SharePoint if you have corporate network) is the best because the presentation can be shown reliably on a browser in case everything else fails. This is a dangerous situation. We must assume that you will get only a PC with some Windows version running. PowerPoint version is not guaranteed. Here are the best practices. Till Office 2007, videos were never inserted – the files were linked. So if you carried the presentation file only, the video was always missing! Carrying or embedding a video does not guarantee that it will run on any PC. It needs the right kind of codec to run. Of course you have no interest in learning what is a codec. Therefore, PowerPoint makes it simpler for you by converting your videos automatically to a format which will run on any Windows PC. Choose File menu – Info – check if you see an Optimize Compatibility button. If you don’t see it, very good. One thing less to worry about. If you see it, open it and choose Presentation Quality. It will do something. Let it finish. Technical Note: For those who are interested, PowerPoint checks if the format requires a codec which other PCs may not have. Most common is QuickTime. Then it converts the videos which are already in your presentation to WMV format by re-rendering them. All the special effects, animation, trims etc will be preserved. It asks you to choose the quality. Choose High quality for important presentations, Medium for most presentations. Low quality is only for mobile device delivery. You may not realize it, but this is a very complex activity which is completely simplified for us by PowerPoint. Connect to internet from a mobile phone or some other connection and check all links to external web sites. Do NOT use corporate network. Sometimes you link to web pages / images which are inside the corporate network and these don’t work outside your office. 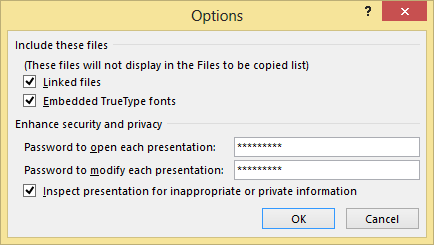 DO NOT just copy the presentation file. Embedding fonts and linked files is a very good feature. It ensures that your presentation will run on any PC containing PowerPoint. This may sound like an overkill but it is an absolute necessity. Many conferences and seminars use laptops provided by the AV agency which is running the show. These people often have very old operating system and PowerPoint versions. If you have used new features in your presentation, most of it will either not run at all or will be horribly disfigured. Download PowerPoint Viewer. This is the latest version as of today. It works with presentations created in all versions of PowerPoint. Check this on internet before downloading to ensure that you are downloading the latest version. If your job depends upon delivering presentations – mine does – then you need some extra precautions to ensure that your presentation runs EVERY TIME without a flaw. This is a tricky item. You cannot control it till you reach the venue. But at least then you should check this one out thoroughly. If your presentation depends upon live bandwidth, you must test everything as soon as you arrive at the venue. Perform a full rehearsal and repeat just before the beginning of the session if possible. Hotels usually provide insufficient bandwidth. I find it easier to buy a local SIM card with large Internet Top Up. Unfortunately, due to thick walls of ball rooms and conference venues, the 3G / 4G may not work. You must test it before the presentation. Carry a projector. I carry my own. Epson EB1775W. 3000 Lumen and very good for upto 100 participants. This supports WiFi so you can put it anywhere and not worry about cable length. Unfortunately, I am not able to use the WIFI on Windows 8. Carry an plug which can connect two VGA cables. Very often the length of the VGA cable is short. It forces you to sit at the wrong spot. 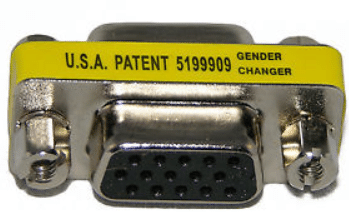 So carry a spare cable (10 USD approx) and a male-to-male VGA connector (costs approx 1 USD) This Gender Changer is an invaluable piece to have. 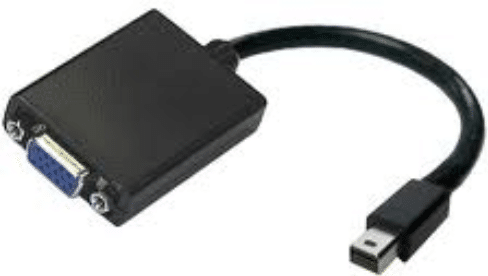 Many customers have two VGA cables but don’t have this adapter. With it you can extend the cable length. Batteries. Carry at least two AA, two AAA and one 9 volt battery. Why? Because the microphone batteries die in couple of hours. If you conduct long sessions, the batteries are a lifesaver. If you don’t carry them, it becomes a chaotic situation. You are mid way into your presentation. Everything stops. Someone scrambles to find the AV guy / gal who is invariably missing from the scene by now. They don’t get new cells, someone rushes out to buy them or request from admin… it is hilarious and sad. Just buy the cells and carry them. A laser pointer and clicker is useful. I use a special mouse which has all of these so I don’t need to carry it. Power Adapter is necessary if you travel internationally. The composite ones are good but usually don’t fit into artistically restrictive crevices even in the most sophisticated conference rooms. It is best to buy the dedicated adapters (2 pieces at least) as soon as you land in a country. Convenience store on the airport is the best bet as stores within the city usually do not keep such adapters. Finally, a printout of your presentation may be all that you have in case of power failure or some technical glitch. No worries. Just go on stage and express yourself from your heart. No amount of technology, tools and accessories can substitute for depth of knowledge, experience and passion to add value to the audience. Previous PostDoctor’s Toolkit – sneak previewNext PostFacebook analytics using Excel 2013 Power Query: Without programming! Doc, this post is a great guide, thanks for taking time in sharing. I can relate and understand that these are all your hard learned lessons. Your overall blog in entirety is superb and enough material for a book. Hope to see it soon. Thanks for the feedback. Yes.. It is based upon all the mistakes I have done. All my posts have something based upon practical issues people face. But people are finding my posts to be long. Why would they read a book? Don’t cut short and leave out the details. The details are useful and rare to find elsewhere. You are doing a great service by recording and sharing these. Thanks TNC. Will work on it. I agree. I am trying to include content which is typically undocumented but very useful. I am new to blogging. When I search for content before writing, I am realizing that most content is either just an expanded version of feature specific help or it is too focused on one product and feature. The overall picture and integration is largely missing. Very impressive and details experience sharing! Indeed, as JCI (Junior Chamber International) Trainer, I wish to request of sharing your article with all other JCI members. are working to create positive change. Thanks for the feedback. Please share it with your members. If you have any suggestions for more articles do let me know. I’d buy the book!! This is really useful for trainers/coaches like me. thanks heaps. Technical tips great and v. useful as usual Doc. Liked the ending (when everything fails”) very true, superb, Have seen presenters getting affected (incl me) when technical problems came in the way. Have even faced self-expression and love for sharing failing. Thats when i used ‘Healing Technolgies’ to save myself and the audience :). Thanks Madhu.. The show must go on.